WunderGist brings you the eight most notorious criminals, armed robbers and killers that Nigerians can never forget in a hurry owing to their exploits that has become legendary. In the history of Nigeria, there has been a history of crime and criminals who have become folk heroes and legends in themselves. Some of them have had their names entrenched in the history of the country as bandits who almost debilitated the nation but whatever way you look at them, they deserve the roll call of heroes and villains are made. Here are the most notorious criminals Nigerians can never forget. For those who grew in the 80s, the name Lawrence Nomanyagbon Anini can never be forgotten as one of Nigeria’s most notorious armed robbers who reigned supreme in the old Bendel State, now Edo and Delta. Anini also known as The Law, reigned supreme in the 80s and was so bloody that his matter was even discussed at the State Security Council meeting in the General Ibrahim Babangida’s regime. Born in 1960 in a village about 20 miles from Benin City in present day Edo State, Anini migrated to Benin at an early age, learned to drive and became a skilled taxi driver, before he took to crime and quickly became a much-feared gang leader whose approach got people trembling. His gang members included Monday Osunbor, later known to be a dreaded killer without mercy, Friday Ofege, Henry Ekponwan, Phillip Iwebelue, Prince Kingsley Eweka, and others. Starting out as car snatchers, bus robbers and bank thieves predominantly in Benin, Anini, and his gang extended his criminal acts to other towns and cities in other states in the country. Anini was also able to penetrate the police echelon and had some top officers as his gun suppliers and informants, the biggest of them being Inspector George Iyamu who benefited immensely from the gang. In an operation in August of 1986, the Anini team struck at First Bank, Sabongida-Ora, where they carted away N2, 000. But although the amount stolen was seen as chicken feed, they left the scene with a trail of blood as many persons were killed. On September 6, same year, the Anini gang snatched a Peugeot 504 car from Albert Otoe, the driver of an Assistant Inspector General of Police, Christopher Omeben. In snatching the car, they killed the driver and went to hide his corpse somewhere. It was not until three months later that the skeleton of the driver was spotted 16 kilometers away from Benin, along the Benin-Agbor highway. A day after this attack, Anini, operating in a Passat car believed to have been stolen, also effected the snatching of another Peugeot 504 car near the former FEDECO office, in Benin. Two days after, the Anini men killed two policemen in Orhiowon Local Government Area of the state. Still, in that month, three different robbery attacks, all pointing to Anini’s involvement, took place. A day after the operation, Anini, The Law, turned to a ‘Father Christmas’ as he threw wads of Naira notes on the ground for free pick by market men and women at a village near Benin. Anini thus spear-headed a four-month reign of terror between August and December 1986. Anini also reportedly wrote numerous letters to media houses using political tones of Robin Hood-like words, to describe his criminal acts. Even the Military Head of State, Gen. Babangida got worried over the activities of Anini and asked the then Inspector General of Police, Etim Inyang where the bandit was and gave him the mandate to get him dead or alive. Such was his prowess and myth. Anini was finally arrested in a major operation led by Superintendent of Police Kayode Uanreroro, who brought his reign of terror to an end. He was nabbed on December 3, 1986, at No. 26, Oyemwosa Street, opposite Iguodala Primary School, Benin City, in company of six women, following a tip-off by residents of the area. 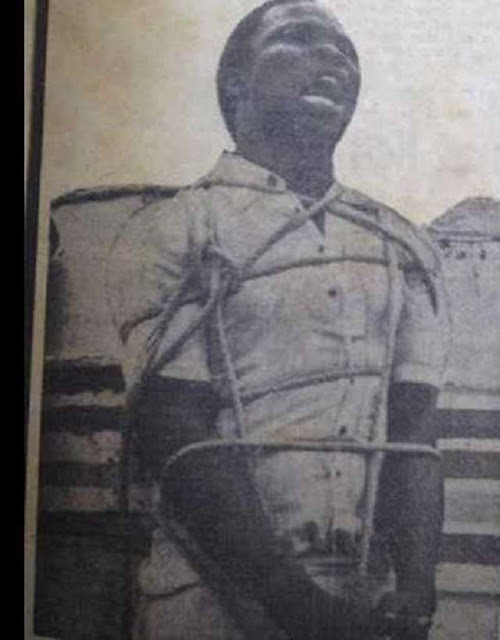 Anini who was confined to a wheelchair throughout his trial following the amputation of one of his legs was sentenced to death by Justice James Omo-Agege of the Benin High Court and was executed on March 29, 1987. Naturally, ‘Doctor’ Ishola Oyenusi should have taken the top spot on this list going by the fact that he was the first known armed robber in the country. But Anini’s exploits in the underworld took the shine off Oyenusi. In the history of crime in Nigeria, Oyenusi, was a cold-blooded armed robber who held sway in the early 70s, stands on a very special threshold that none can ever dream of attaining. 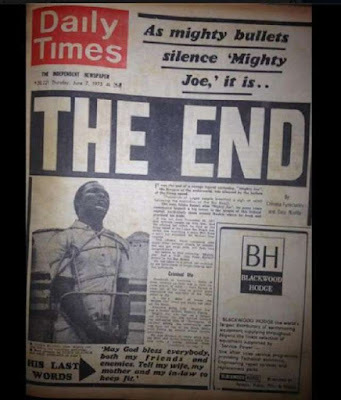 He took the nation by storm shortly after the Civil War ended and before he was executed on Wednesday, September 8, 1971, at the famous Bar Beach show in front of 30,000 watching Nigerians, no one believed that ‘The Doctor’ would be captured, as he was famed for ‘disappearing’ or his body not penetrable by bullets. In fact, he must have had so much faith in his charms that he smiled all the way to the stake and even as soldiers aimed their rifles at him and his co-criminals, Oyenusi still radiated an aura of invincibility. The phenomenal armed robber rose from the ashes of the Nigerian-Biafran Civil War that spanned three years, from 1967-1970. Oyenusi was a charismatic, cocksure gangster whose lordly disdain for the law cast the terrifying portent of social breakdown, and had come to be celebrated as the quintessential bandit of his time. During his reign of terror, ‘Doctor’ Oyenusi carved a name for himself as the most brutal terror the country had ever known and lived up to another of his nickname of ‘Dr. Rob and Kill’, because he was known to kill with impunity and his myth was legendary. He unleashed boundless terror on many Nigerians and would kill even for a stick of cigarette. Oyenusi was no doubt, the uncrowned emperor of Nigerian robbers and he was described as the ‘first celebrated armed robber in Nigeria’, regarded by some as the pioneer of conventional armed robbery in Nigeria. 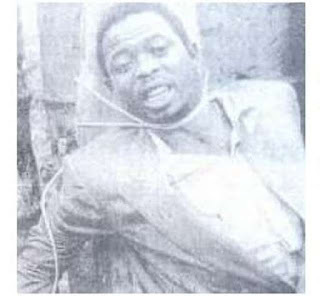 Legend has it that Oyenusi got into active robbery back in 1959, but he committed his first major robbery when he snatched a car along Herbert Macaulay Road in Yaba, Lagos, and killing its owner in the process, just because his girlfriend was broke and needed money to buy her make-up. He eventually sold the car for £400 (Nigeria’s currency then) and handed the money to the lady. He actually snatched the first car he saw on the road. Such was the ferocious nature of his audacity. By the end of the Civil War, Oyenusi had metamorphosed into a cold-hearted robber who took delight in causing pains to his victims. The last robbery that did him in was when he and his gang attacked the WAHUM factory in Ikeja in March 1971, where they stole the princely sum of £28,000, which was unprecedented in those days. A police officer was also killed in the process. 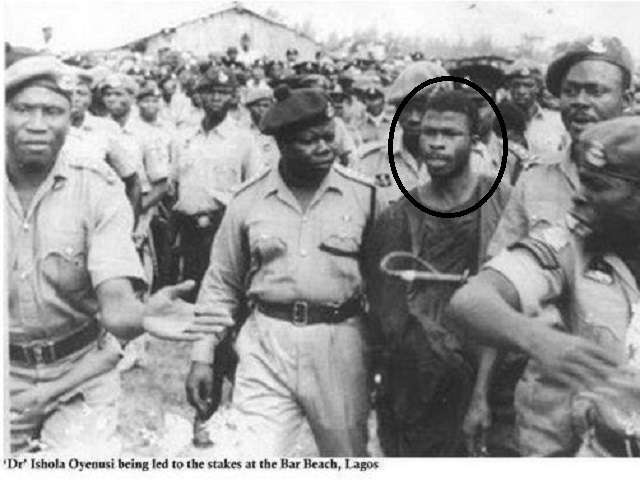 ‘Doctor’ Ishola Oyenusi’s execution was celebrated by relieved Nigerians who trooped out en-masse to the Bar Beach in Lagos to witness the end of a man who had held the country to ransom. The 36-years-old Godogodo rose from being a slum boy to the leader of a gang that defied all reasons, struck with precision, killed without mercy and terrorized Lagos and the south-west with reckless abandon. Before his arrest on August 1, 2013, Godogodo gave the Lagos State Police Command so much headache for 14 years, so much so that on the day he was arrested, the command erupted in joy: at least its men would be safe from his guns. Originally from Ogun State, Egunjobi was on the wanted list of the police for over 10 years and the way he managed to evade the police is still legendary. In fact, he was at a time, on the top of the Most Wanted list of the Command with several Police Commissioners assigning the toughest of cops on his trail. At that time, any robbery in Lagos had the imprint of Godogodo, with him leading or one of his boys being responsible. 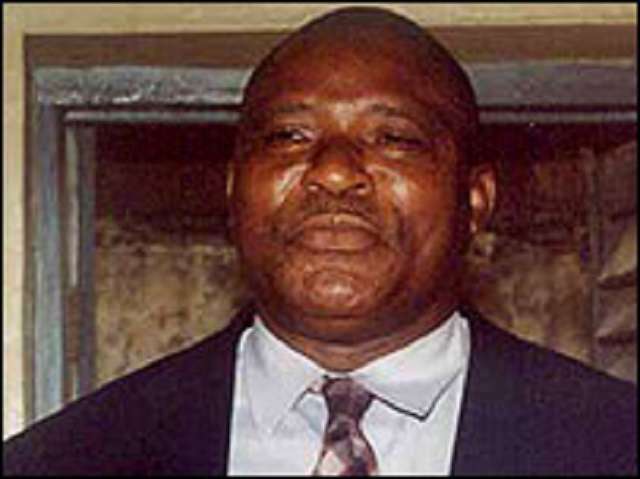 He was famed for leading many robbery operations, especially on banks, with the infamous reputation of killing over 100 policemen in Lagos State. Godogodo began his voyage into the deadly world of crime after spending seven years in prison for what he considered a minor offence. 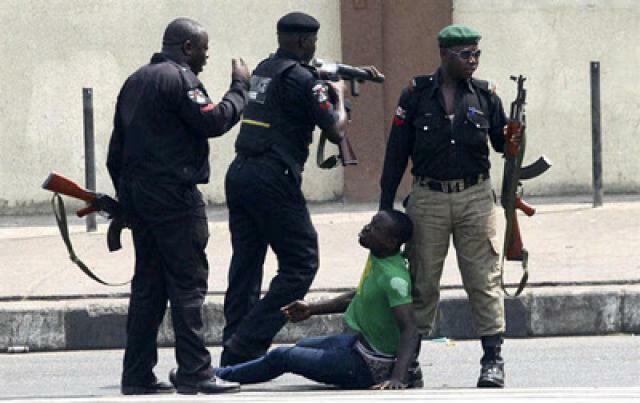 As a scrap dealer in the slum of Gatankowa, Abule-Egba, he was involved in a fight and the police arrested him. With no one to bail him out, Godogodo was sent to jail and in his mind, he believed his going to prison was an injustice and blamed the police for it. While in prison, he became acquainted with more deadly armed robbers and formed an alliance with them and took the time to understudy them. When he finally left prison, he decided that he was going to deal with the police for sending him to prison for seven years. During his interrogation, Godogodo told the police that he took only raw cash during his operations and would only attack a place he knew there would be enough cash to cart away. He also said he doesn’t have any bank account as he invested all his money in the property immediately after each operation. Abbey Godogodo visited many Lagosians with sorrow, tears, and blood. Many would not forget Sunday, September 9, 2012, when he and his gang terrorized the state and left indelible marks in the minds of many families after he led a coordinated attack in the city where many innocent people including policemen lost their lives. 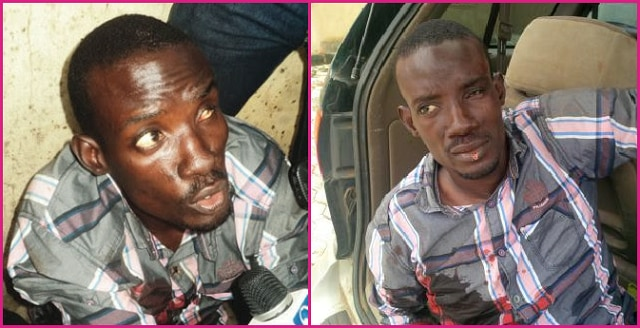 He revealed how he coordinated the bloody operation and gave chilling details of how he led members of his gang to cart away millions of Dollars from bureau de change operators in Agege and Gbagada areas of Lagos. The Lagos State Police Command led by the then Commissioner, Umar Manko, mandated the Special Anti-Robbery Squad (SARS), led by Superintendent of Police, Abba Kyari, to bring an end to the reign of Abbey Godogodo and that began intensive investigations which led to the capitulation of his empire. Manko was given direct orders by the then Inspector General of Police to make sure the Godogodo phenomenon was quashed at all cost. After the gang attacked the Murtala Mohammed International Airport, where two police inspectors and more than five people were killed and over N100 million stolen, the police decided to focus on profiling the suspect, because, up to that point, no one knew anything about him or what he looked like. The police also began looking at the possibility of preempting his subsequent operations. 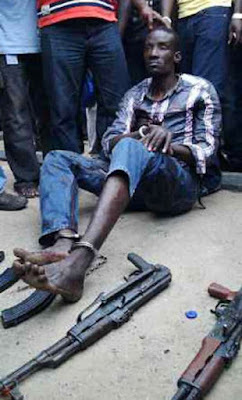 Okwudili Ndiwe, alias Derico Nwamama, was also one of the deadliest armed robbers to have come out of the Nigeria. In the early 2000s, the 22-year-old Derico Nwamama was probably the King of the Underworld in the Eastern parts of the country; a clear replication of the likes of Lawrence Anini and Ishola Oyenusi. Derico had risen from a street urchin and pick pocket to a dreaded crime king and the mere mention of his name sent shivers down the spines of traders and residents of Onitsha, the commercial capital of Anambra State, and other parts of the east. The traders could not display their wares with peace while many slept with one eye open. Derico sacked commercial banks in Onitsha, carting away millions of Naira. Travelers who had to pass through the state held their breaths, expecting the hoodlum to strike at any time. The then Governor of the state, Chinwoke Mbadinuju, became an old man over night with worries on how to handle the menace of Derico. He was described as the personification of terror. From Nnewi to Nkpor, from the villages in Umuleri to towns in Ihiala, the old and young were terrified at the mere whisper of Derico Nwamama. At that time, he was said to be invisible and could not be arrested. The dreaded Bakassi Boys went on a manhunt for the man known to kill without batting an eyelid. According to legend, Derico Nwamama had killed over 100 people including 25 police officers whose lives he mercilessly wasted. He was a master of countless bus robberies and will not blink twice before pumping his hot lead bullets into the beating hearts of hapless victims. And after his successful raids, he would boast and declare himself invincible. Derico seemed to have placed a lot of faith and confidence in the charms prepared for him by the traditional witch-doctors. With the police and other security forces unable to bring Derico Nwamama and his terror regime to a close, the onus fell on the Bakassi Boys, the militant wing of the Anambra Vigilante Services (AVS), a local vigilante group set up to curb crime and criminality in the South East. 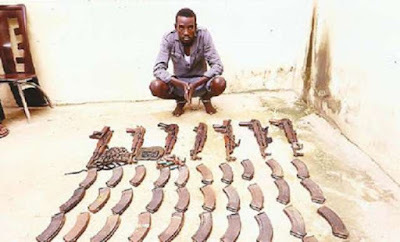 The group were then at the forefront of the hunt and capture of Derico Nwamama and on Tuesday, July 3, 2001, the hitherto invisible criminal was nabbed on his way to Onitsha from Agbor, ostensibly on one of his crime spree. On July 9, 2001, six days after Derico was captured at the Niger Bridge, the Bakassi Boys did to him what many had earlier predicted. Chanting war songs, they drove in their convoy around the town and ended at the Ochanja Market Junction along the popular Upper Iweka Road in Onitsha. Derico was dragged out from the bus, looking gaunt and severely beaten, a trademark of the vigilante group. His body bore cuts and gashes, a testament to what he must have gone through in their hands. He must also have known that the day of reckoning has come. He was in obvious pains but no one seemed to care. Still chanting war songs and egged on by the enchanted crowd, one of the commanders of the Bakassi Boys named Okpompi, addressed the crowd, telling them they were in the state not for politics but to fight crime. “My name is Oddy, alias Derico, alias Nwa Mama. I appeal to you the people of Anambra State, please don’t kill me, I don’t like evil. It was when I killed Chiejina that people thought I am a strong guy, you know. What was to follow remains one of the most macabre displays of public executions in Nigeria. With the speed of a guillotine, a cutlass handled in the strong arm of one of the Bakassi Boys flew and came down with an unforgiving thud, landing on Derico’s slim neck. In a flash, Derico was beheaded. His severed head rolled on the floor before the crowd while his convulsing body collapsed on the ground, with bright-red blood gushing from his carotid arteries. Before he became a man of God and the Director-General of Prison Rehabilitation Mission International (PREMI), and the Presiding Bishop of Christ Vessel of Grace Church, Bishop Kayode Williams was one of Nigeria most notorious armed robbers. He was a member of the Ishola Oyenusi gang who stood out when his boss was captured. He was known to be a dreaded robber who wasted no time in killing his victims. During a confession years ago, Bishop Willams narrated how he pounded little babies and used them for spiritual fortification. He was converted to Christianity while serving a 10-year jail term and since then, he has not looked back in preaching to prisoners and trying all he can to rehabilitate them. Legend has it that Monday Osunbor was the main man behind the dreaded Lawrence Anini gang. He was known as the executioner and sharp shooter. 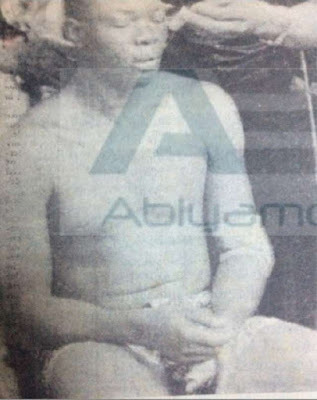 Though not much was known of him during the Anini trial as his leader took the shine off him, it was gathered that he was a short-tempered stammerer who did not hesitate in killing their victims. 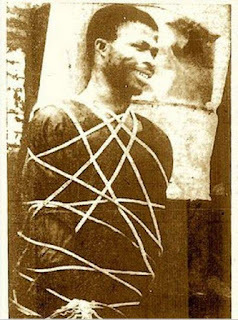 He was executed alongside Anini in 1987. The name Shina Rambo has refused to go away from the consciousness of Nigerians who either witnessed his crime spree or were unfortunate to live in that era. The Abeokuta, Ogun State-born Rambo was a terror in the 90s and the brain behind many crimes in the Western parts of the country where he robbed and killed with impunity. He was so feared even by the police that many thought he was invisible as he was thought to disappear anytime the police closed in on him. It is believed that the policemen who killed him did not even know that it was Shina Rambo. He was said to be on his way to Lanrewaju Motors to buy a Pathfinder SUV when he was apprehended by the police on the Ojota New Garage Long Bridge. Rambo was not the one driving when the police stopped him and his gang, they discovered a lot of money in a cartoon in the trunk of the Datsun car. When they started questioning him on the possession of such huge an amount, an argument ensued and he attempted to disarm one of the policemen. It was one of the policemen at the other side of the road who shot Rambo down. It was said that it was easy to shoot him because he was not with his charms since he was not going for an operation. However, another account has it that the person killed was not the real Shina Rambo as another ex-bandit who claimed to be the real Rambo, is now a man of God by the name Mathew Oluwanifemi. In his confession a few years ago, pastor Oluwanifemi described himself as a hardened criminal, a terror, and killer. He narrated how he specialized in robbing exotic cars on highways and banks and that nothing could stop him, not even security operatives as he was totally invincible. 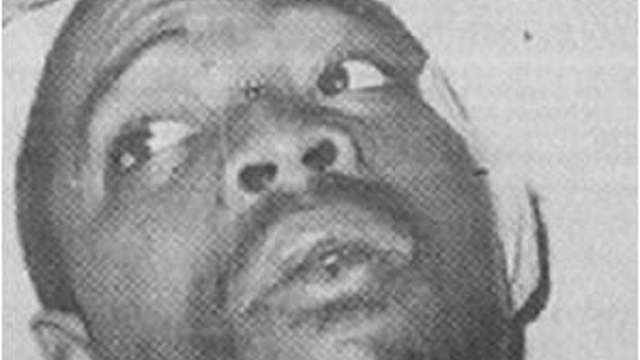 Shortly after the notorious kingpin of armed robbery in Nigeria, Ishola Oyenusi was executed, his second in command, Isiaka Busari, better known as Mighty Joe, took over the scene and became the defacto king of the underground. Nigeria was still coming out of the pangs of the civil war and with the death of Oyenusi, they thought the era of violent crimes had been nipped in the bud but little did they know that another hoodlum would spring up and become deadlier. In Mighty Joe’s gang were ex-soldiers who were demobilized and with their know how in the handling of guns and other deadly weapons, they held the nation, particularly the South West, to ransom, robbing and killing with reckless abandon. Mighty Joe was even deadlier than Oyenusi and was known to operate at anytime he felt like and taking a human’s life was nothing to him. For many years, he constituted himself a big terror to the people of Lagos, the then Federal Capital, especially around Mushin where he lived and practiced his trade. He strode the hemisphere like a colossus from 1971 when his boss was killed, till 1973 when he was nabbed after robbing a hotel bar attendant, Michael Osayunana, of the sum of ₦10. The arrest of Mighty Joe, according to legend, was as dramatic as his reign of terror. The self-styled ‘Strongman of Idi Oro’ was caught when someone he had earlier robbed, recognized him and fingered him to the police and he was nabbed without any fight, as against his various boasts that no man born of a woman can arrest him due to his strong belief in his spiritual powers. He was said to pay some herbalists huge amounts to prepare charms for him so that he would remain invincible. While he was in prison awaiting his day at the Bar Beach, Mighty Joe converted to Islam and even offered prayers that the execution is reverted. That was never to be.